The ICORE (International Confederation of Revolver Enthusiasts) Postal Match was a lot of fun today. Welcome to the International Confederation of Revolver Enthusiasts. ICORE serves the international community to promote action shooting competition with revolvers.For more information, please contact a member of the Board of Directors or a Match Director. We are always happy to talk “wheel-guns”. Our sport combines elements of the Bianchi Cup, IPSC, and the Steel Challenge into demanding competition exclusively for revolvers. Our standard paper target is the NRA D-1 target with 4 scoring areas. Scoring is based on time, including time added or subtracted per the scoring rules. Falling and stationary steel plates are also used in ICORE events. Some typical Courses of Fire here illustrate the type of shooting that is available in ICORE Club, Regional and International Revolver Championship events. Everyone seemed to have a great time and the weather did hold for the entire match. 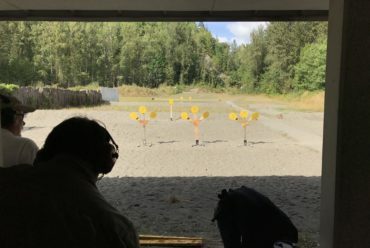 For those of you looking for a fun, friendly, inviting and active gun club the Chilliwack Fish and Game Protective Association looks like the club to beat. Thank you again to the event organizers and to the participants. The view from the back of the range at Chilliwack Fish and Game Protective Association. Here is a look at a couple of the stages from the ICORE match.